While I am partial to a thin and crispy crust when it comes to my pizza, once in a blue moon I want something with a little more bite to it, especially when it sounds super simple to make. 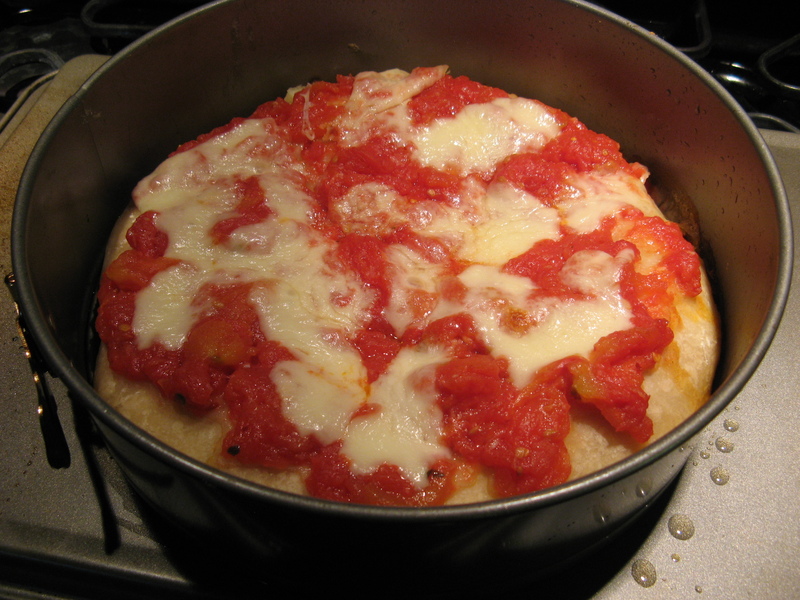 A while back I came across a recipe for a deep-dish pepperoni pizza using a cake pan, and with these hot and humid days upon us the last thing I really want to do is make something complicated for dinner so this was right up my alley. I do my best to avoid using my oven when it’s too hot, but, this pizza was an exception since the total oven time was less than twenty-five minutes and prep time was just under ten minutes since I opted to make a Deep-Dish Margherita instead. To make things even easier for myself I used store-bought refrigerated pizza dough that I brought to room temperature prior to using. 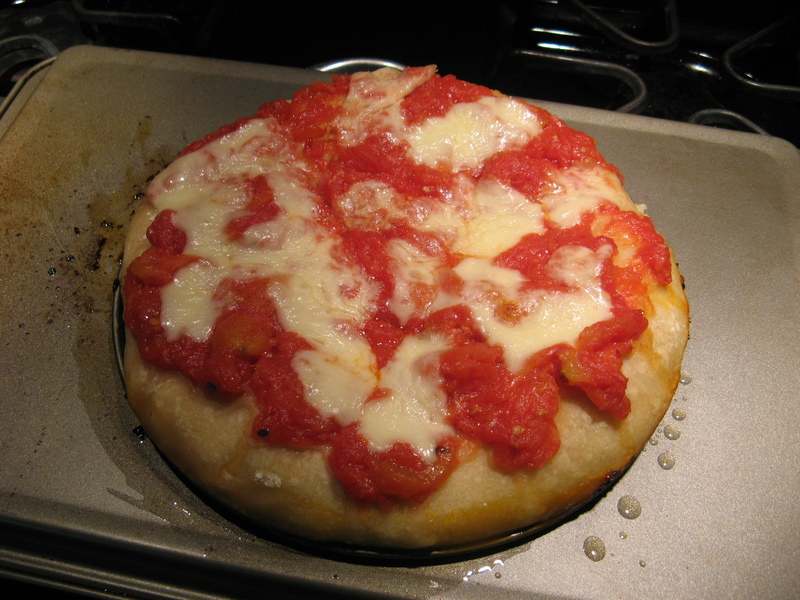 While the dough was “warming” I made the pizza sauce by combining whole peeled tomatoes (crushed by hand), olive oil, grated garlic, crushed red pepper and salt. I set this aside so the flavors could marinate and then thinly sliced some fresh mozzarella. Meanwhile, I preheated my oven to 475 F with an inverted cookie sheet on the bottom shelf and brushed the bottom and sides of a 9-inch cake pan with olive oil. And I’ll admit it’s not the best looking pizza, but, it was delicious! This may be my go to pizza sauce next time I make pizza! On the bottom oven rack place an inverted cookie sheet and preheat the oven to 475 F. Brush the bottom and sides of a 9-inch cake pan with 2 tablespoons of olive oil. Press the dough into the pan and bake for 10 minutes, until puffy and lightly golden. Combine the tomatoes, remaining olive oil, garlic, crushed red pepper and salt in a large bowl and allow the flavors to marinate for a few minutes. After removing the pizza crust from the oven, top with the sauce*, leaving a 1/2 inch border, and top with the fresh mozzarella. Return to the oven for another 10 minutes, until the cheese is bubbling. Let the pizza cool for 5 minutes before slicing. *You will have extra sauce.